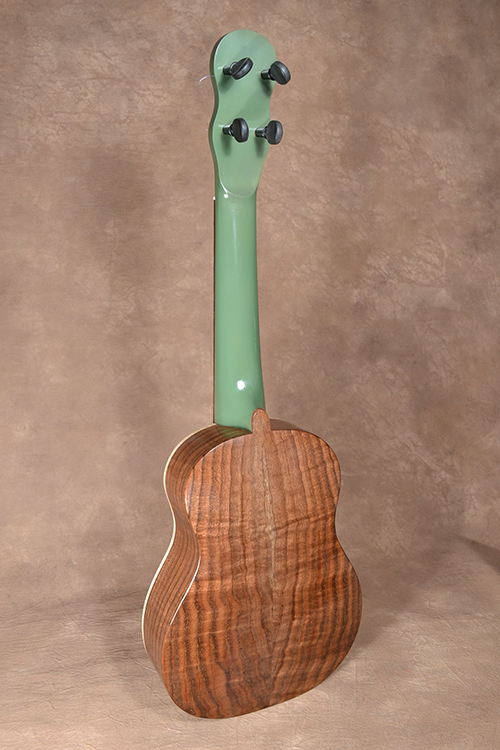 A few years ago I played with this color combination in a tenor instrument that I built and thought I would re-create the idea but this time in a concert size ukulele. The body is Curly Claro (or California) Walnut. The soundboard is a very tight grained Sitka Spruce. This makes a pretty instrument with a big full sound. It has good sustain with good note clarity, surprising volume and no muddiness. It is just as excellent for strumming as it is for picking. These creations are of excellent construction quality and finish. They are smooth all over and their craftsmanship is second to none. On every detail of a Pohaku instrument you’ll be pleased from their unique design to the meticulous set-up and fretwork. This instrument is a pleasure to look at, to hold and to listen to. It measures about 23” long and weighs approx 16ozs. A custom Pohaku Hardshell is included.